Karwa Chauth is not only a festival that helps every married woman to strengthen their wedded life with their husbands but also with their mother-in-laws. So, now you can send best gifts for mother-in-law on Karwa Chauth via FlowerAura’s wide assortment of gifts ranging from jewelries to cosmetics, sweets to flowers etc. Karwa Chauth is a festival typically celebrated in North India but popular across the country for its custom and ritual that explicitly reflects the love between a husband and a wife. But Karwa Chauth isn’t an occasion that involves just a husband and a wife. It is also an occasion that sees an active participation of mother in law (Saas) when she offers Karwa Chauth Sargi to her daughter in law and expresses that she cares for her. Your mother-in-law also does that for you on every Karwa Chauth. Right? 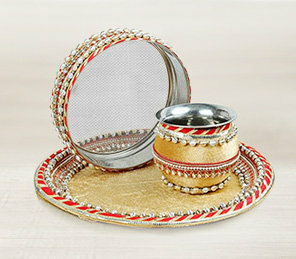 So, now it’s high time you show your love and care for her by giving her a Karwa Chauth gift. Wondering how could you do so? Well, FlowerAura offers you all the best Karwa Chauth gift ideas for mother-in-law that are sure to express your love and care for her in a perfect way. Moreover, now you don’t have to go outside to buy a Karwa Chauth gift for her as you can seat at your home and place your order online from FlowerAura. So, now it’s time to build your bond stronger with your saasu maa wherein our wide range of Karwa Chauth gifts for mother-in-law will do the trick. Gifts are a wonderful way to express your love and admiration for the one close to you. They fill the heart with immense love and strengthen relationships. And FlowerAura has decided to give that push to the relationship with amazing Karwa Chauth gift ideas to melt the heart away. Therefore, FlowerAura has come up with the best Karva Chauth gift for mother in law to help you sweeten up your bond with your mother in law. With the wide assortment of gifts ranging from Sargi to Thali, clutches to cosmetics, sweets to flowers, you can now delight your mother in law with a sweet surprise on Karwa Chauth. So, go ahead to buy a gift for your mother-in-law on Karva Chauth from FlowerAura. Even if your mother in law is staying miles away, your worries are about to be lessened with FlowerAura’s prompt online delivery across India. Yes, now with the aid of FlowerAura’s instant delivery services across India, you can send a Karva Chauth gift to mother in law no matter where does she put up. Just imagine how happy will your mother-in-law feel on receiving a nice gift from you on Karwa Chauth. So, go ahead to send Karva Chauth gift for mother in law from our online gift shop and make your bond stronger with her. To make your Karva Chauth online shopping a happy and hassle-free one, FlowerAura 100% customer satisfaction. It ensures same day and midnight delivery of gifts in more than 200 Indian cities. In fact, if you choose flowerAura to buy gifts for mother in law on Karwa Chauth, you can enjoy free shipping benefit as well. No matter where do you put up, FlowerAura is the best gift shop near you that offers a beautiful range of Karwa Chauth gifts for your mother-in-law. To order a Karwa Chauth gift from FlowerAura, all you have to do is to visit Floweraura.com, choose a gift as per your preference, and place your order just within a few clicks. Once your order gets confirmed with us, our delivery team will make sure to deliver the gift to your doorstep on the correct time. So, go on! Make moments special with FlowerAura’s wide variety of Karwa Chauth gifts for your dear mother-in-law and take your celebrations to new heights.